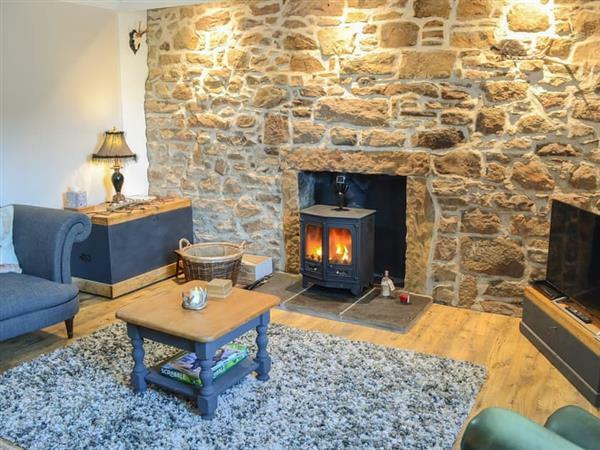 Wallace House in Dornoch, near Tain, Highlands sleeps 5 people. Wallace House near Tain is an imposing, historic, detached stone house, situated in the heart of the renowned village of Dornoch. Built in 1800, on land owned by the Duke of Sutherland, this bright and spacious home was completely renovated in 2018 and is ideally located for a family beach holiday. The main living room has been thoughtfully furnished with superb sofas and a warm, welcoming wood burner. The high ceilings and stunning exposed stone fireplace add to the character and charm. There is a large kitchen/dining room, which is well-equipped with built-in units and a wine fridge. The original staircase, with ornate polished wood banisters, leads up to the three generously proportioned bedrooms. 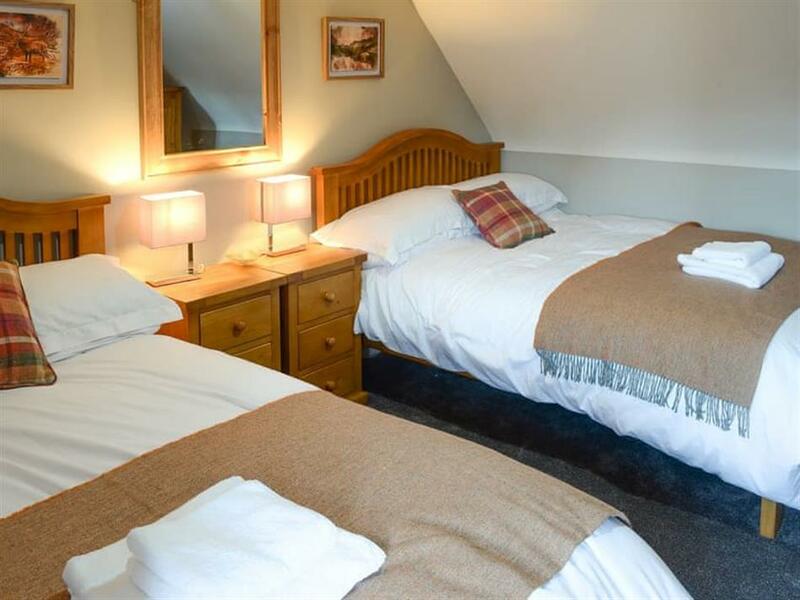 All rooms are superbly presented, with good quality furniture and colour coordinated soft furnishings. Wallace House is ideal for families and groups looking for a very good standard of self-catering accommodation with all amenities just a short walk away. This wonderful property is situated along a quiet lane, just off the main square in the centre of the historic village of Dornoch, a Royal Burgh since 1628. This attractive village, built of mellow sandstone, is one of the prettiest in the Highlands. The centrepiece is the 13th-century cathedral, with original stained glass windows. Dornoch also has an excellent selection of unusual and attractive shops, as well as a number of good restaurants and bars, all just a few steps away. The renowned Championship golf course of Royal Dornoch is just 200 yards along the lane. The nearby sandy beach is ideal for families and dog walkers alike. Situated just off the renowned North Coast 500 route, which encompasses some of the most outstanding landscapes to be found anywhere in the British Isles, there are numerous places of interest within easy reach. Loch Fleet Nature Reserve is close by and attracts a wide variety of wading birds and has been designated as an Site of Special Scientific Interest. Just a short drive away is Dunrobin Castle, seat of the Dukes of Sutherland for over 600 years. Visitors are welcome to explore the castle and grounds, which were modelled on the Palace of Versailles. Golfers are spoilt for choice, with not only Royal Dornoch on the doorstep, but a number of other championship courses within a short drive, and the property has a stone built store, perfect for golf clubs, and with power for charging trolleys. Fishing, sailing, kayaking, hill walking, climbing and mountain biking are all local pastimes. The beach is 300 yards from Wallace House near Tain. With the shop 200 yards, and the pub & restaurant is 50 yards from Wallace House. Living room: With wood burner, 32 Freeview Smart TV and DVD player. Kitchen/dining room: With electric cooker, microwave, fridge, dishwasher and wine cooler. Utility room: With freezer and washer/dryer. Shower room: With double walk-in shower, toilet and heated towel rail. Bedroom 1: With 2 double beds (one for children). Bedroom 2: With zip and link twin beds (can be super king-size on request). Bedroom 3: With double bed (access from one side only). Gas central heating, electricity, bed linen, towels, Wi-Fi and logs for wood burner included. Travel cot and highchair. Welcome pack. Enclosed lawned garden with sitting-out area and garden furniture. Private parking for 2 cars. No smoking. Please note: There are 6 steps in the garden. Holidays at Wallace House run from Saturday to Saturday. Pets allowed at Wallace House. For a better idea of where Wallace House is, you can see Wallace House on the map below. Wallace House is in Sutherland; should you be on the lookout for a special offer, you can find all the special offers in Sutherland. It's always worth checking to see what is on offer at the moment. Do you want to holiday near Wallace House (UK5981), you can see other cottages within 25 miles of Wallace House; have a look to find your perfect holiday location.